Bart Jaworski, Director and CEO of Group Eleven Resources sits down with Maurice Jackson of Proven and Probable to discuss his companies exploration for zinc in Ireland. 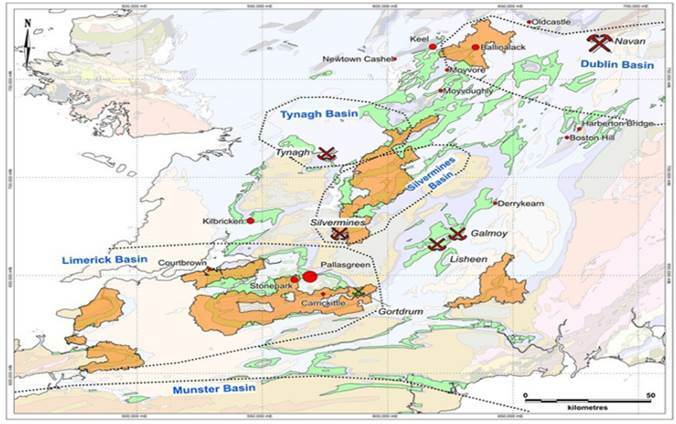 Listeners will be introduced to the unique value proposition Group Eleven Resources of the largest land position of any explorer or miner in Ireland. All together encompassing approximately 3,200 sq km, or 320,000 hectares or nearly 800,000 acres, which hosts 2 flagship projects the Stonewall and the Ballinalack respectively. Maurice Jackson: Joining us today is Bart Jaworski, the CEO and director of Group Eleven Resources Corp. (ZNG:TSX.V; GRLVF:OTCQB), which is known for advanced stage zinc exploration in Ireland. Mr. Jaworski, for someone new to the story, who is Group Eleven Resources and what is the thesis you are attempting to prove? Bart Jaworski: Well, our overall thesis is that by Group Eleven Resources having the largest land position in the richest country for zinc in the world, that being Ireland, we have a very substantiated vision, and that vision is to discover the next big zinc deposit in the country. 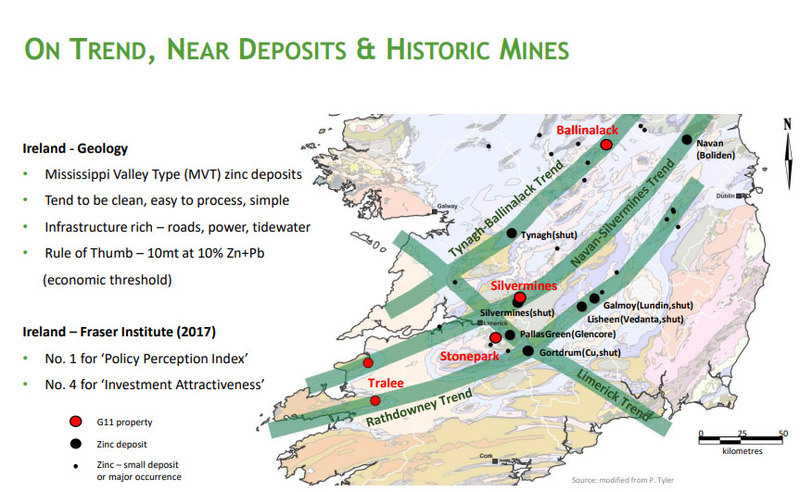 We already have the second and third largest undeveloped zinc occurrence in the country, that being the Stonepark current resource and the Ballinalack historical estimate, and those are second only to Glencore’s very substantial Pallas Green deposit, which is one of the largest undeveloped zinc deposits in the world. People-wise, of course, you need people with the right mind-set and experience to drive towards this goal of discovery. 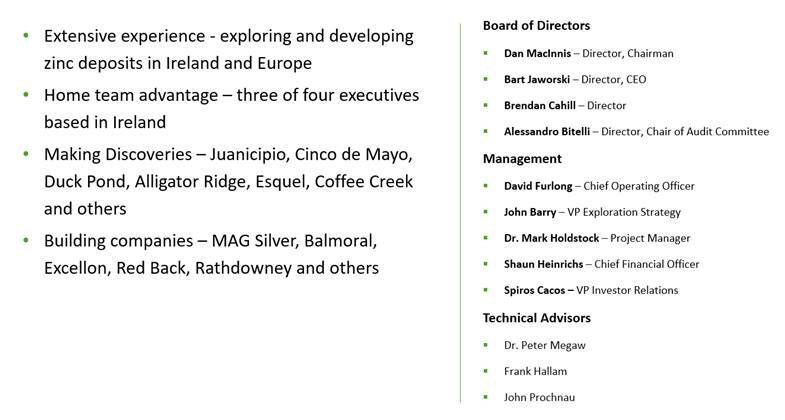 And we certainly have that part covered with MAG Silver as a strategic backer and people like Peter Megaw and Dan MacInnis involved, as well as,] very experienced Irish geologists like John Barry, David Furlong and Dr. Mark Holdstock, who have spent most of their careers exploring for zinc in this country. Maurice Jackson: Before we discuss the unique value proposition of Group Eleven Resources, I would like to begin our discussion today at the 10,000-foot level regarding zinc, it’s a metal that is not on a lot of radars. 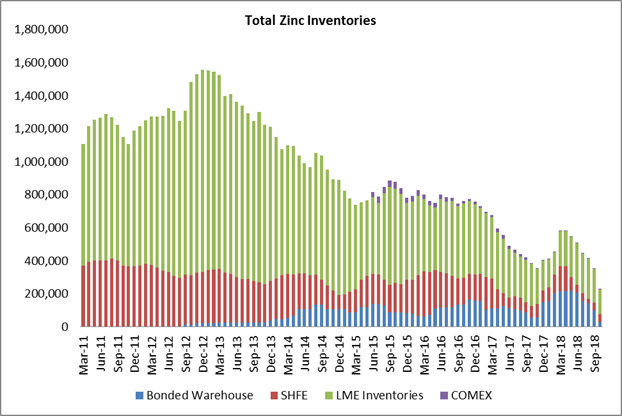 What can you tell us about the zinc supply and demand fundamentals? Bart Jaworski: Zinc demand is roughly 14 Mt/year, so that’s about US$40 billion/year turnover (at current prices). Zinc is the fourth most consumed metal, after iron, aluminum and copper. The price of zinc was on fire in 2016 and 2017—roughly doubling from 70c/lb to $1.60/lb; then in 2018, the price took a bit of a breather, falling to about $1.00/lb in September and now starting to rise again towards the $1.20/lb level. Zinc is primarily used for galvanizing steel, which means making steel rust proof and that then feeds the construction and automotive sectors. Zinc is also an essential nutrient for embryonic growth and normal metabolic processes inside the human body. So that’s a bit about the demand side. On the supply side this is where things get interesting. A number of mines around the world have been shutting down because they’ve run out of ore or because they are no longer economic to run because, for example, they’ve been starved of capitalized for too long, etc. Lisheen, Galmoy and Century are a few examples of large mines that have been depleted over the last few years. This has led to a shortage in mine supply, which in turn has led to diminishing global inventories—which are now down to levels we haven’t seen since 2007/2008 and remember, back then, prices reached as high as $2.08/lb. So the question becomes why are prices relatively muted now, despite these multi-year inventory lows? Well, I think the key issues are the trade war rhetoric, Chinese slow down fears and of course, the threat of a supply response. Now obviously, no one has a crystal ball, but I suspect trade war talks will conclude constructively or at least I hope so. The Chinese economy, I suspect, still has a number of very large buffers at its disposal and one has to wonder if the trade talks with the U.S. do indeed falter the Chinese government could notionally just double-down on internal infrastructure growth again bolstering its Belt and Road initiative even further, for example. On the supply response, as a former mining analyst, I definitely learned over the years that slippage on getting new mines up and running happens more often than not. So you always want to take a haircut to guidance on start-ups. Then there is the question of Chinese supply, which accounts for about half of world’s mine supply. Historically it has been the case that whenever zinc price went up, Chinese supply would go up as well, leading to a moderation of zinc prices. This hasn’t been the case so far this cycle. The reason is that China has imposed a number of strict environmental regulations on industry, including mining, over the last year or two. The effect has been that a lot of small “mom and pop” zinc mines in China have been shut down and that has suppressed the supply response from China in a big way. So, that’s the crux of the market. There is one other key bright spot that I believe is starting to show great promise and that is the evolution of zinc batteries. I think this could be a potential game-changer for the industry. The background here is that zinc was always an ideal metal for batteries since Edison’s time 100 years ago; however, the problem has always been “rechargeability,” you couldn’t recharge a zinc battery without needles growing inside the cell and quickly bursting the battery. A few years ago a scientific breakthrough by the U.S. Naval Research Laboratory changed all that and this was written up in the prestigious Science magazine in April 2017; by the way, I recommend people take a look. With the advent of 3D lattice technology, electric charges can now be dissipated homogeneously enough to prevent needle growth and whamo! Zinc now has the potential to compete and offset the likes of Li-ion batteries. That’s pretty exciting. Now there are small zinc batteries for cars and small equipment, etc., which I don’t think will have much impact on zinc demand. Then there are the large zinc batteries aimed for grid power storage and here is where we could definitely move the needle significantly on annual zinc demand. 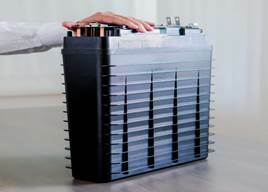 A great example of these large zinc batteries is NantEnergy, which is run by a California-based billionaire named Patrick Soon Shiong. He’s developed a Zinc-Air battery, which run on photons, zinc and air; and he’s demonstrated he can successfully run dozens of cell phone towers and villages completely off the grid in Africa and other regions. There is a great video on Bloomberg interviewing Mr. Soon Shiong on this technology, plus the New York Times has recently written it up as well. Maurice Jackson: Group Eleven Resources projects are strategically located in Ireland, provide us with some historical context on the relationship between zinc and Ireland. Bart Jaworski: Ireland is estimated to be No 1 in terms of zinc found per square km, so it’s a very prospective country. It also hosts some of the world’s largest zinc deposits (e.g., Boliden’s Navan mine and Glencore’s Pallas Green deposit). It’s infrastructure-rich and has year-round tidewater for shipping. The product is clean and you’re close to consumer. Irish zinc concentrates tend to be very good quality. 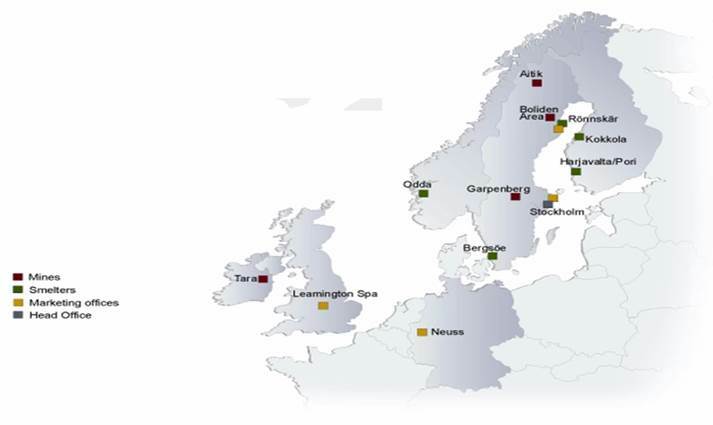 European smelters are around the corner in Norway, Sweden, Belgium, etc. Politically Ireland is a safe, first world jurisdiction with security of tenure and rule of law. And lastly, the Fraser Institute, which is the only think tank that ranks the world’s mining jurisdictions, ranks Ireland No 1 in terms of Policy Perception Index for five years running. So Ireland has all the ingredients you’d want. One key aspect to add is that over the last 70 years of mining history in Ireland, a general rule of thumb of what it takes to break-even economically in Ireland is what is known as “10 and 10” or 10 Mt at 10% Zinc+Pb combined. That reflects the infrastructure and tidewater (so in more remote part of the world were you need to truck in your diesel and truck out your concentrates; you may need 50–100 Mt to break-even. In Ireland you typically need much less, which is very comforting to know). 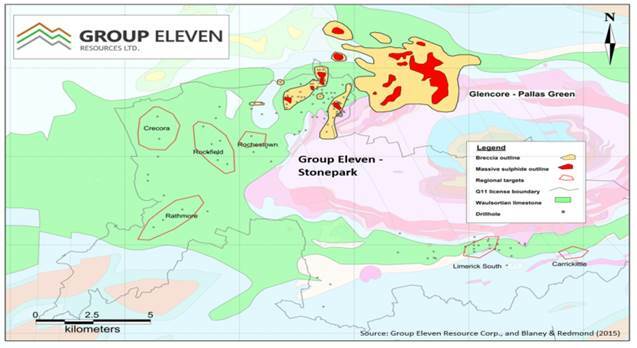 Maurice Jackson: Bart, now that we know the virtues of exploring for zinc in Ireland, how much of a land position does Group Eleven Resources have in Ireland? Bart Jaworski: We have the largest land position of any explorer or miner in Ireland. All together we hold approximately 3,200 sq km, or 320,000 hectares or nearly 800,000 acres. This gives us the dominant position over two geological basins, which gives us the ability to think big and think outside the box, and this greatly aides our exploration approach. Maurice Jackson: You mention approach, is there anything different that you are doing that others are not? Bart Jaworski: Well, yes, absolutely! Our “Big Think” approach is what really makes us different. Essentially, we are tearing up the old geology textbooks and putting them back together again using a very open minded and thorough approach to exploration by systematically conducting detailed data compilation. Mining data in Ireland goes back all the way to the 1200s and beyond and we are coupling that with cutting edge exploration techniques such as seismic surveys, airborne geophysics, ionic leach soil sampling, etc. Now, not just anybody can have the “Big Think.” You can’t have the “Big Think” without the ground position, right? Because if you come up with a great idea, it’s likely on someone else’s ground and you can’t do anything about it. You also can’t do the “Big Think” without the right people—big picture thinkers—and that’s again where the likes of Peter Megaw and Dan MacInnis, both from MAG Silver, come in, as well as deep Irish bench-strength with the likes of Dr. Mark Holdstock, John Barry and David Furlong. Maurice Jackson: A virtue of having the largest ground position in Ireland is that Group Eleven has two flagship projects. Let’s delve into them shall we. Mr. Jaworski, introduce us to your first flagship project, the Stonepark and the unique value propositions it presents. 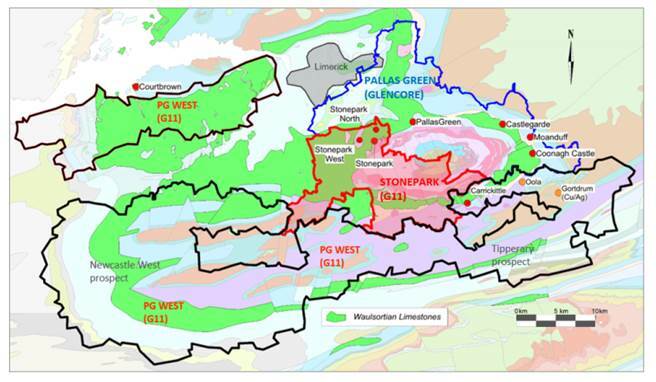 Bart Jaworski: Well, at Stonepark we are very excited because we are right next door to Glencore’s Pallas Green deposit, and we think we might have at least some of the key mineralizing faults from that deposit trending onto our ground. Our ground, by the way, covers nearly the entire prospective geology in this area, outside of Glencore’s ground. We have by far the largest land position in this region much bigger than Glencore’s area and we cover about 1200 sq km or 300,000 acres. We also already have a maiden resource 43-101 compliant in the Inferred Category on our ground totaling 5mt @ 11% Zinc+Pb (Stonepark deposit). That is located only about 1km away (very close) from Glencore’s Pallas Green deposit, which hosts about 44mt @ 8% Zinc+Pb. Our deposit is about 200–400m deep. whereas Glencore’s Pallas Green is 300–1300m deep, with its new discovery called Caherline about 10mt @ 10% Zinc+Pb at the deepest part of that range (i.e., towards 1300m). We know Glencore has been actively drilling at Pallas Green since early 2017. So from the above you can see that our Stonepark deposit is much shallower and about 30–40% higher grade. But the key is this! This is an emerging camp. The discoveries here at Pallas and Stonepark are relatively new and yet this is already the most metal-endowed region within all of Ireland, outside of Boliden’s Navan deposit. And yet the main mineralization structures (or faults) have not yet been found. It’s a complete mystery. Usually in Ireland, the zinc occurs butted up against a fault. But in this camp the main structure appears to be further away, suggesting that what has been discovered to date is actually the periphery of the system. Thus, the heart may be lurking somewhere underneath, in what we call the Limerick volcanics. So the question becomes how do we find the center of the system? And this is where our preliminary drilling and the Tellus survey come in. We announced last week the start of a preliminary 1500–2000m drill program, which will be primarily aimed at answering the big geological questions on the architecture of this camp. If we hit some mineralization too, that’s great, but the primary aim is geological. We’re going to couple this data with a large ongoing airborne survey that is currently being flown by the Irish Geological Survey. It’s called Tellus and it comprises flying 2,500 sq km or 620,000 acres or so, covering our ground, Glencore’s ground and our nearby Silvermines ground and using three state-of-the-art detection methods all together, which are radiometrics, magnetics and electro-magnetics. This information will be publicly available early next year and will hopefully tell us where the major faults are and how they line up with the known mineralization in this camp. Now we already have our suspicions on where this key fault corridor might be—one clue is that the main Pallas Green body seems to trend in a NW orientation; this is from an academic paper that was published in 2015. If you continue that trend towards the south you line up perfectly with our Carrickittle and our Limerick South prospects. At Carrickittle, for example, there are about a half dozen historical holes that intersected about 5m @ 12% Zinc+Pb and they have been largely forgotten about since the late 1960s. However, now that we know about Pallas Green and Stonepark, these 1960s prospects are starting to look at lot like the small satellites you see just outside the Pallas Green deposit to the north, which poses an interesting question: Do we have a “quasi-mirror image” down to the south? Maurice Jackson: Let’s move north now and discuss your second flagship project, Ballinalack. What has the company excited there? 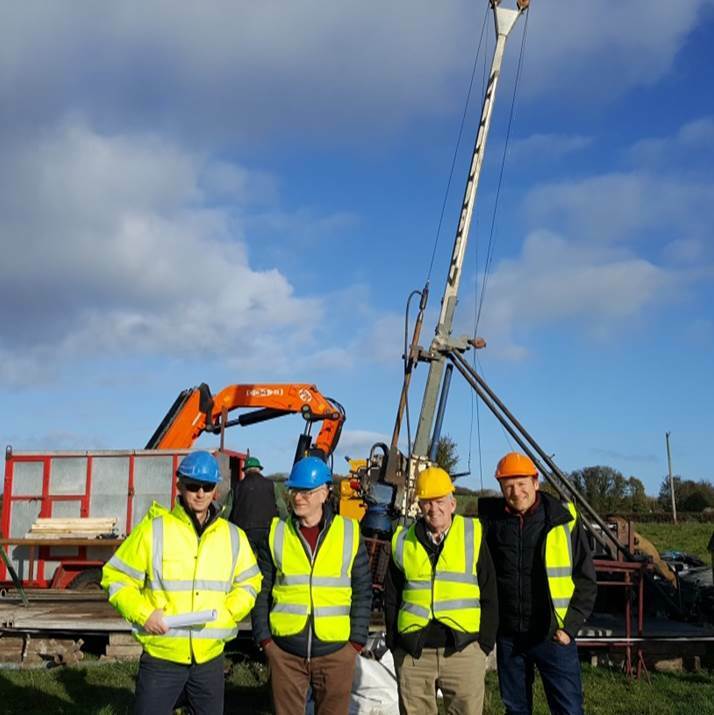 Bart Jaworski: At our second flagship project, Ballinalack, we also have an exciting idea that we will be testing as part of the Big Drill of 2019. It is located about 50km away from Boliden’s giant Navan zinc mine, which has approximately 100 Mt @ 10% Zinc+Pb; it’s mostly mined out now, but still operating. It’s the biggest mine in Europe and considered one of the top five zinc deposits in the world. Ballinalack is unique as it’s still close enough to Navan to have well-developed Navan Beds on the property in addition to the other prospective horizon called the Waulsortian limestone. 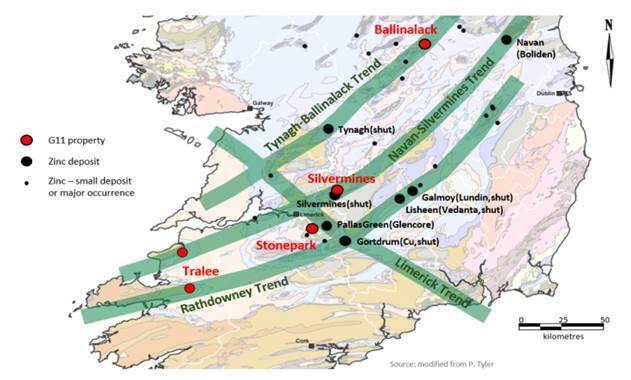 In fact, Ballinalack is the only known zinc occurrence in Ireland that has significant mineralization in both horizons. Interestingly, in the 1970s, when Ballinalack was discovered, the old-timers only drilled down to about 300m to define the historical estimate, which by the way totals 7.7 Mt @ 7.3% Zinc+Pb, which is not too far off from our 10 and 10 rule of thumb. So drilling beyond 300m was considered “very deep” at that time. Now, of course, mining reaches much deeper, for example, at Boliden and Pallas Green, drilling is going down well beyond 1000m or 3300 feet. Our big idea at Ballinalack is that the Navan Beds directly underneath the historical estimate have not yet been tested for Navan-style mineralization. Case in point, of the 30 holes historically drilled deep enough to actually intersect the Navan Beds in the vicinity of the old estimate, a surprisingly high number, about half of the holes, hit significant mineralization. And directly underneath the historical estimate the area is virtually undrilled. So our preliminary drilling of two holes earlier this year was also primarily aimed at geology, and we successfully identified (1) that cross-faults exist and they seem to have a lot more to do with mineralization than ever recognized before, and (2) that the Ballinalack fault is much steeper than previously thought, which shows definitively how previous drilling was missing the target. By the way, Group Eleven Resources intersected 10m @ 10% Zinc+Pb in an area of known mineralization, which is also comforting, plus a zone of mineralization in the Navan Beds. Note: The orange zone (4a-4e) is our hanging-wall Navan Bed target (which has been virtually undrilled) and targets 1, 2 and 3 are our footwall Navan Bed targets where historical drilling has yielded significant mineralization worthy of follow up (all the red dots are the historical holes, which were drilled deep enough to intersect Navan Beds, and half of them hit. ‘n/a’ means not assayed for silver. Maurice Jackson: What are your plans going forward at Ballinalack? Bart Jaworski: We will be relogging and in some cases re-assaying some of the historical core with the aim of sharpening our understanding of the architecture of this area even further, and we will then do more drilling in 2019 as part of the Big Drill. Are these brownfields explorations that the company is undertaking? Bart Jaworski: If “brownfield” means an area that was previously mined, then the answer is no. However, I think in this case, you are referring to the notion that in these areas we have seen significant heavy lifting already done on the exploration side by previous operators, than definitely yes. For someone new to the term brownfields, please share how that improves the probability of discovery. Bart Jaworski: Well, with the heavy lifting already done for us, this puts us in great position to allow us to get up the learning curve much quicker than if we had to drill all those initial holes ourselves. So we’re walking on the shoulder of a giant amount of historical work, and if you infuse that with cutting edge technology and truly open minded thinking—that’s where the magic happens. Maurice Jackson: For current and prospective shareholders, the story doesn’t end with zinc. You have recently discovered some silver at the Ballinalack. How was “Big Think” responsible for the discovery and share the results with us. Bart Jaworski: Correct, at Ballinalack only some of the historical intervals were ever assayed for silver and those that were often had good silver numbers in them, say between 20–100 g/t, and our highest was about 380 g/t. So we know there is silver in the system, but that was never calculated historically. I see that as a potential sweetener to the story, which has yet not been borne out. Also at Stonepark and the broader Limerick basin, we have the idea that because you have a lot of volcanics intruding limestones, you might expect to see some overlooked deposit types, which can host a much higher precious metal component, for example, CRD deposit types that you see in Mexico. Bart Jaworski: Similar to most juniors, our exit strategy is to make a large discovery and then sell it to the highest bidder. We are not interested in becoming miners. Maurice Jackson: Switching gears, I’ve learned from some of the most serially successful in industry—from Rick Rule, Doug Casey, Jayant Bhandari, Mickey Fulp and Bob Moriarty—that the people running the business are equally if not more important that the latent material in the ground. Mr. Jaworski, please introduce us to your board of directors and management team and the unique skill sets they bring to the Group Eleven Resources. Bart Jaworski: We have four on the board currently. Dan MacInnis is our chairman. (a) He is the retired CEO of MAG Silver (and currently sits on the MAG board) (b) Dan has over 40 years of experience and has been involved with seven discoveries during his career including Duck Pond and Juanicipio (c) Interestingly, Dan worked in Ireland for five years back in the late 1970s/early 1980s with Noranda, so he definitely knows the lay of the land in Ireland. Alessandro Bitelli is our chair of the Audit Committee. He is currently the CFO of Lundin Gold, and interestingly was the CFO of RedBack when it was taken over for $10 billion by Kinross back in 2010. Brendan Cahill is a lawyer and all round very sharp guy. He’s the CEO of Excellon Resources, which is mining the Platosa silver deposit in Mexico. We have John Barry and David Furlong, who I’ve mentioned earlier in our discussion. Both are Irish geologists. ex-Rathdowney Resources (which is another European zinc development company). John was the founder and CEO of Rathdowney. So both John and David have deep experience with Irish-style zinc deposits and with operating in Ireland. Dr. Mark Holdstock is a very well-known geologist in Ireland. He recently joined us (in early 2018). He led the team that discovered the 20-Mt SWEX extension of the Navan orebody. So John, David, Mark and myself, we’re a home team. All of us live in the country we’re operating in and that’s different from many juniors and a big plus because we have our ear close to the rail. Peter Megaw is the brainchild behind MAG Silver’s success in Mexico with the Juanicipio discovery. Peter is the chief exploration officer at MAG. and he’s a big help on our “Big Think” initiative. We also have John Prochnau and Frank Hallam as advisers. John Prochnau is on Doug Casey’s Exploration Hall of Fame actually for his Esquel and Alligator Ridge discoveries. John also worked on our Ballinalack project back in the 1970s. Frank Hallam has a lot of experience in M&A with the majors and has been involved with over a $1 billion in financings over his career. Last but far from least are Shaun Heinrichs, our CFO, and Spiros Cacos, our VP Investor Relations. Maurice Jackson: Tell us about Bart Jaworski; what makes him qualified for the task at hand? Bart Jaworski: I’m an exploration geologist and ex-mining equity analyst. I have about 24 years of experience since 1994, my first year in the field. I was an analyst for about 12 years. Initially, I began with Raymond James in Vancouver for about nine years and then for over three years with Davy in Ireland. I’ve been on a lot of site visits and met with a lot of CEOs and VP Ex’s over that time frame. I also covered many exploration and mining companies over the years. The reason I ended up in Ireland is because my wife, who is Irish, wanted to move back home after being in Canada with me for nine years. And that’s how I ended up at Davy in Dublin covering the UK listed golds, plus Rio Tinto and the iron ore sector. As an exploration geo I discovered the original soil anomaly at Coffee Creek, which later became a multi-million ounce gold deposit (which was taken out for $0.5 billion when Goldcorp took over Kaminak). Going back a little further, I also helped discover industrial minerals in the Iskut area. Bart Jaworski: We have just under 60 million shares outstanding. So at our current share price (14c) our market cap is only CA$8.4 million or about US$6 million. About 20 million warrants and options outstanding: more than half of those are set to expire this December. Cash: our last Quarterly Financials have $3.2 million in the till. We have no debt. Maurice Jackson: Let’s discuss some numbers: What is your burn rate? Bart Jaworski: Burn is about $100k–$130k/month, so call it roughly $1.5 million per annum. So our runway is still fairly comfortable, at least another 12 to 15 months doing what we need to do, depending on how hard we step on the gas pedal. Bart Jaworski: Yes, we’ve been lucky enough to garner the support of about a dozen institutions, mostly during the IPO, but some pre-IPO and some post-IPO. Most well-known institutions include Sprott, US Global, Galileo and Logiq. Bart Jaworski: About half our 60 million shares are owned by high-net worth investors, which is about 30 million shares. The rest is owned by MAG, Teck, the funds and insiders. Maurice Jackson: Are there change of control fees? If yes, please convey the terms. Bart Jaworski: There are no change-of-control fees for M&A transactions but there are fees associated with management being fired by the board without cause, which is fairly standard. Maurice Jackson: When is the last time you purchased shares and at what price? Bart Jaworski: I actually bought shares last just after our last press release last week at a price of 13c and 12.5c. I believe at least one other insider bought shares on the heels of last weeks’ press release as well. Maurice Jackson: Any redundant assets such as patented mining claims and or reversionary interests, meaning are Group Eleven Projects 100% owned by Group Eleven Resources? Bart Jaworski: We don’t have any patented mining claims in Ireland. We own all our licenses 100% except at Ballinalack where we have 60% interest with the remainder owned by a large Chinese zinc producer called Nonfemet. At Stonepark, where we own roughly 77% and the remainder owned by a small Irish exploreco. 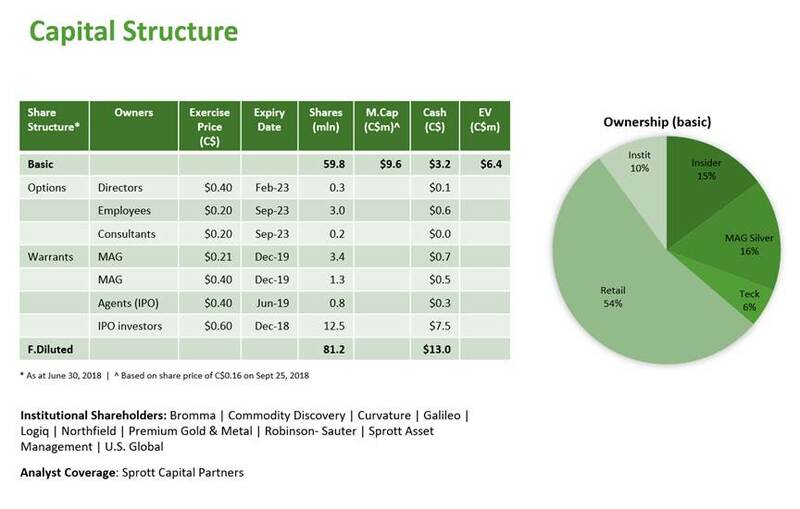 Important to note, these joint venture interests are participating, i.e., they have to pay their share of exploration costs or they get diluted down. Maurice Jackson: All right, sir, you’ve survived the storm. Mr. Jaworski, multilayered question, what is the unanswered question for Group Eleven Resources, when should we expect results, and what will determine success? Bart Jaworski: Results, we are currently doing a “preliminary drilling” campaign (1500–2000m) and we should have results from that over the coming weeks and months. The results of the Tellus survey will also be forthcoming early next year and that will tell us a lot. We will then couple the two datasets, i.e., the drill data and the airborne data and that should lead to very high-priority drill targets, which will be part of our Big Drill in 2019. A few months ago we put out a maiden resource at Stonepark measured 5mt @ 11% Zinc+Pb combined. We are working on updating the Ballinalack historical estimate, but we are not sure yet if we can upgrade to a current estimate without re-drilling, but we are looking into it so that something else to be aware of. BART JAWORSKI: Well, I’m an optimist, as long as people keep remembering the lessons of Adam Smith and the Wealth of Nations. I think we’ll be ok and the world economy will keep on growing and with it, so will the prosperity of humanity. Other than that I try not to sweat the small stuff. Regarding Group Eleven, obviously exploration is a risky and cyclical business, so one needs to be aware and cognizant of that. However, with high-risk comes high-rewards, and that’s really what I’m focusing on as a shareholder myself. Bart Jaworski: I guess one important element of the Irish exploration landscape is the support from the government, specifically iCRAG, which stands for the Irish Centre for Research in Applied Geosciences. This is a government-industry-academia partnership that is well-funded and has a number of very smart people working on a number of fronts. One of the main remits of iCRAG is to help companies like Group Eleven find the next zinc mine in Ireland. So, interestingly, the individual who recently stepped into the role of CEO and Director at iCRAG is a gentleman by the name of Dr. Murray Hitzman. Dr. Hitzman was once at the White House shaping Science and Technology policy, as well as, the head of the Colorado School of Mines and more recently at the U.S. Geological Survey. 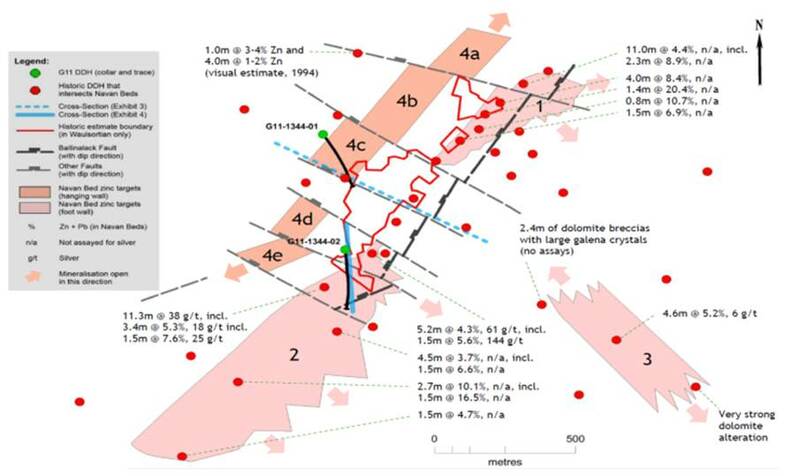 He is one of the leading experts on Irish-style zinc deposits and has written many academic papers on the subject. When Murray was announced as the Head of iCRAG, I personally thought this was a major signal by the Irish government and a catalyst, really, for future discoveries in Ireland. Maurice Jackson: For someone listening that wants to get more information on Group Eleven Resources the website is here. And as a reminder, Group Eleven Resources trades on the TSX-V: ZINCG and on the OTCQB: GRLVF.For direct inquiries please contact Spiros Cacos at 604 630 8839 Ext. 503 and he may also be reached at s.cacos@groupelevenresources.com. And last but not least please visit our website provenandprobable.com, where we interview the most respected names in the natural resources space. You may reach at contact@provenandprobable.com. Bart Jaworski of Group Eleven Resources, thank you for joining us today on Proven and Probable. Images and graphs provided by the author. This entry was posted in Base Metals, Exclusive Interviews on November 12, 2018 by admin.